GRECE – Stoa Poikile - Its walls were decorated with paintings done by the best artists of Classical Greece, showing Athenian military triumphs, both mythological and historical. Most famous, perhaps, was a picture of the battle of Marathon (490 BC) by Polygnotos. It was a popular hangout and an ideal shelter from adverse weather conditions, a gathering place where people met to have pleasant conversations and to listen to famous philosophers of Athens, such as Zeno and the Stoics. It was built between 475 and 450 BC, and was originally named the Porch of Peisianax, after the Athenian who funded its erection, probably Kimon’s brother-in-law. The Stoa Poikile (Painted Stoa) took its name from the beautiful paintings that adorned it. Part of it has been revealed in a plot at Monastiraki by the American School of Classical Studies. The School now wishes to continue the excavations. In order to do so, the School must either expropriate or buy the plots in 20 Agiou Filippou str. and at Adrianou-Ag. Filippou streets. On these plots two buildings dating from the early 19th century stand (the only buildings left in the eastern façade of the plot), which currently host healthcare enterprises and have undergone various interventions, while their demolition will help revealing a bigger part of the ancient monument (namely part of the back wall, the inner and outer columns, the area in the front of the Stoa Poikile and partially the Eridanos river). The Central Archaeological Council has given the green light to the request of the ASCSA, giving priority to a significant archaeological site with many monuments, which will undoubtely provide new historical evidence. ROYAUME UNI – Cambridge - An archaeological dig in Cambridge has revealed the site's history from the Bronze Age to its role in World War II. Excavation of the site in the north-west of the city began in October, ahead of a large-scale University of Cambridge development. Roman roads and World War II practice trenches were amongst the discoveries. Archaeologists believe the site was first colonised for settlement in the Bronze Age and subsequently saw an Iron Age settlement. 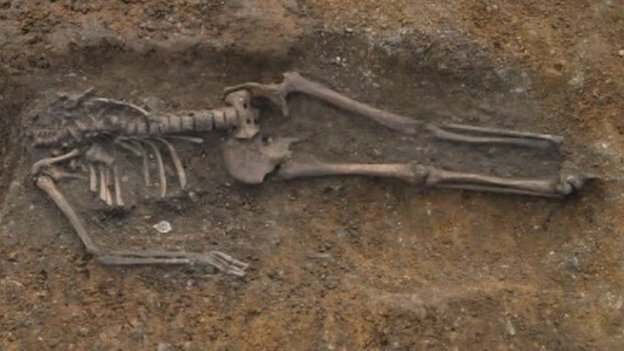 Mr Evans said the dig was the one of the largest excavations to have taken place in Cambridgeshire and had unearthed a "thriving" Roman settlement, from around 60-350AD. "The site is 1,200m long, it's covering 14 hectares," Mr Evans said. "We're investigating this great gravel ridge and finding dense Roman settlement almost continuously along the length of it." 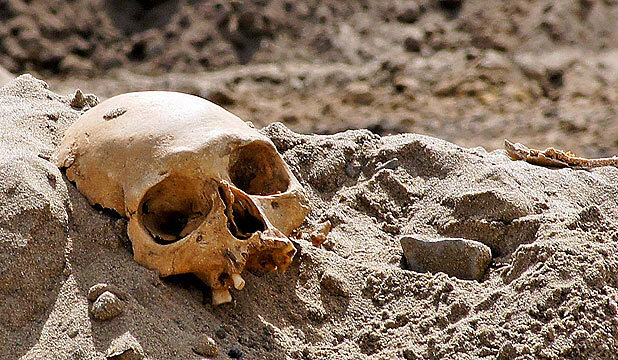 Four Roman cemeteries and 25 human skeletons, some with their skulls missing, have been discovered along with thousands of other remains. NOUVELLE ZELANDE – Whakatane - An archaeologist will assess the Whakatane Hospital car park where a human skull, thought to be of Maori origin, was found during excavation work today. A police liaison officer, along with hospital cultural adviser Pouroto Ngaropo, had determined the skull was likely to be of Maori origin, the board said. Police had been supportive of local custom being observed, and workers had taken part in a karakia for the area, which was known to have been a traditional cultivation site for Ngati Awa. The skull had been removed to Regional Maori Health Services for further determination to allow liaison with iwi about an appropriate burial. 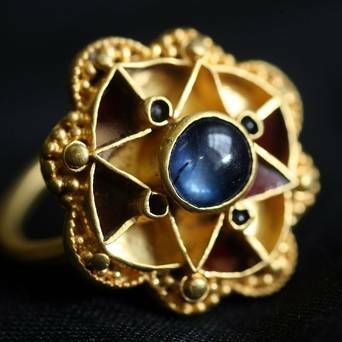 ROYAUME UNI – Escrick - A sapphire ring found in a field by a metal detecting enthusiast is probably much older than originally thought and may have been owned by royalty, according to group of experts convened to examine the object. Archaeologists say the Escrick Ring is likely to be from the 5th or 6th century, and nothing like it from that period has ever been found in the UK before. The expert group, convened by the Yorkshire Museum in York, believes the ring could have royal connections. The ring was found by metal detectorist Michael Greenhorn, from York and District Metal Detecting Club, in 2009 as he searched a field near the village of Escrick, south of York. It measures around 2.5cm across and is intricately made of gold, prestige glass and a large sapphire. The initial assessment of its origin was that it was likely to be Anglo-Saxon or Viking, from the 10th or 11th century. Now the expert group has dated it to a much earlier period. They have also suggested the ring was made in Europe, possibly France, and that it would have belonged to a king, leader or consort - not a bishop which was a previous theory. The wear on the ring also suggests that it could have been a brooch first, which was later made into a ring.